There are 18 new polls today, mostly in battleground states, but no states switched sides there. However, a change comes from a most unlikely location. A new poll in Hawaii shows the race is tied there. If it is really true, this is very bad news for Kerry. He was supposed to win easily there. Of course he could fly out there this week for some much needed vacation time and call it campaigning, but I doubt that he will. As a result of Hawaii becoming a tie, Bush now takes the lead in the electoral college, 254 to 253. Talk about a tight race where every vote counts. The New York Times has a story today saying that both campaigns have abandoned 39 states and D.C. and are putting all their efforts into 11 states. 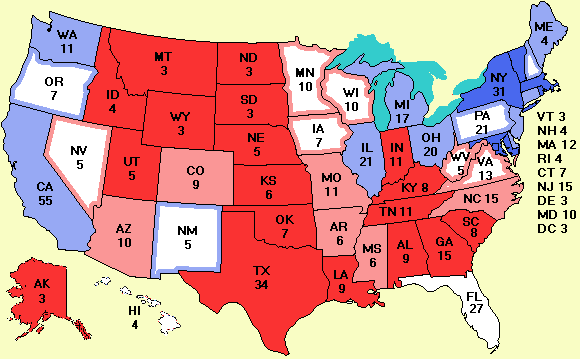 These states, worth 135 electoral votes, are Colorado, Florida, Nevada, New Hampshire and Ohio (which Bush won in 2000) as well as Iowa, Michigan, Minnesota, New Mexico, Pennsylvania and Wisconsin (which Gore won in 2000). My best guess is that Michigan, New Mexico, and Pennsylvania are going to go for Kerry and there is little Bush can do now to prevent that. Bush has the edge in Colorado and probably Nevada, although his promise to bury all of the nation's nuclear waste at Yucca Mountain, which some experts feel is geological unstable, could still hurt him there. Missing from the list are Arkansas, Arizona, Tennessee, and West Virginia. All have been close at one time or another. Apparently both sides feel they are in the bag for Bush, or at least, low priority. I tend to agree, although if the Democratic turnout is exceptionally large, there could be surprises in one or more. Put in simple terms, it mostly comes down to Ohio and Florida. Those are the big prizes. The Los Angeles Times has a story today about new voters. The story can be summarized by this excerpt: "Nationwide, at least two polls in the last week showed that newly registered voters favored Democratic presidential candidate John F. Kerry by double-digit margins. The Massachusetts senator holds an even greater lead, the polls found, among voters 29 and younger... A New York-based television consulting firm randomly questioned 1,225 voters over the Internet and concluded that "cell-only" voters favored Kerry by 53% to 38%." On the other hand, Democratic strategist James Carville once said: "You know what they call a candidate who's counting on a lot of new voters? A loser." The conclusion is that the new voters and younger voters favor Kerry by a large margin, but historically they don't actually bother to vote. If they do this time, it could make a big difference. Raise your hand if back, say, five years ago, you were wishing to have a law school professor fill a daily blog with stories about court cases relating to election law. Well, your wish has been granted. See Rick Hasen's Election Law blog. Today's breaking news on the election law front is that voters in Ohio casting provisional ballots must do that in their own precinct, otherwise it doesn't count. News stories on the possibility of five or six Floridas are starting to appear. I hope they have good beaches but no hurricanes. 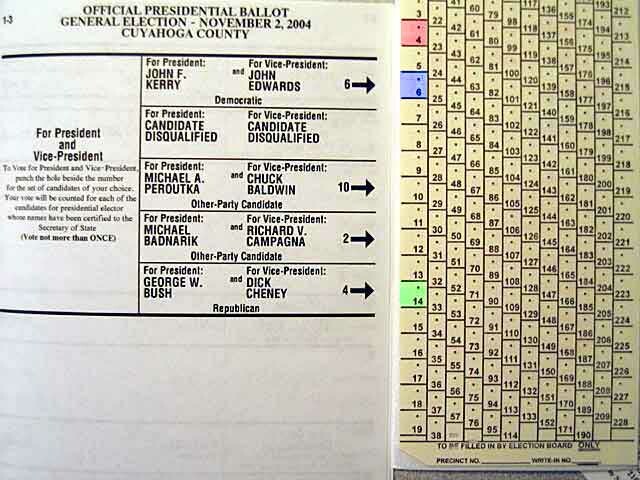 Here is an example of the kind of issue that might turn Ohio into Florida.. Take a look at the absentee ballot for Cuyahoga County, where Cleveland is located. Suppose you wanted to vote for George Bush. Which square would you fill in? If you picked the one I colored in green, congratulations, you just threw your vote away. The one in red is the correct choice to vote for George Bush. Blue is for Kerry. I guess that after losing her reelection bid, Palm Beach County, FL, elections supervisor Theresa LePore must have gotten a new job designing ballots in Ohio. I didn't think ballot design was rocket science. Shows you what I know. Late absentee ballots aren't only a problem for overseas voters. They are also late in Alaska, which may affect the tight Senate race there. Alaskans who are affected by this issue should look at this emergency method for voting by fax. Due to the heavy polling in the swing states, the graphs with state polls have gotten so cluttered as to be useless. Therefore I have added a magnified graph for just October to the swing states. The state graphs can all be reached from here. And finally, a new cartoon of the week. Note to political cartoonists: Florida and Hawaii now are tied. Where are all the undecided voters? At the beach naturally. Click here to tell a friend about this site. To bookmark this page, type CTRL-D (Command-D on Macintoshes). If you are visiting for the first time, welcome. This site has far more about the election than just the map. See the Welcome page for more details.